Barnacle Goose — Green Lane Reservoir, Montgomery County; February 24-27, 2011. Photo by Martin Dellwo. One fed with Canada Geese and a Greater White-fronted Goose. This species has become nearly annual in southeast Pennsylvania almost always found in flocks of Canada Geese. See Malosh and Pulcinella (2008) to review acceptance criteria established by PORC for this species. 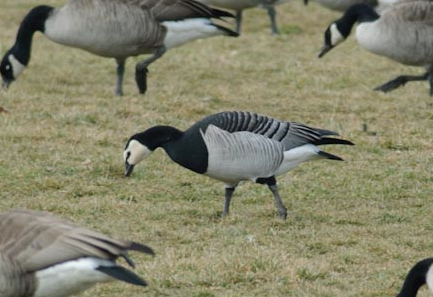 Barnacle Goose – Green Lane Reservoir, Montgomery County. Photo by Martin Dellwo.